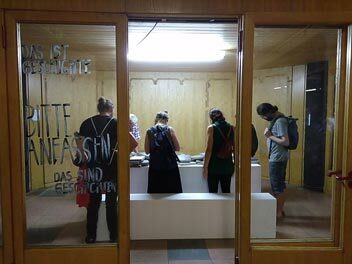 GE-SCHICHTE_N ((HI)STORIES) is an installation that invites visitors to engage with history and stories – to actually touch them. To construct and deconstruct history. The installation consists of a pedestal the size of a beer-garden table, in front of which are two benches. On the pedestal are ninety tablets made of concrete. The concrete tablets are carriers of various materials that each open up three different means of access to a (hi)story. Materials of the constellation are photographs of the sites of the events, archival materials, and excerpts from interviews with my grandfather. Every visitor discovers a different (hi)story in these parts. The fragments link up with the prior knowledge and the associations of the individual. Starting point of my timetravel was the figure of my great-grandfather who was holding a position as a „Landrat“ in Pabianice (Poland) from 1940-43. 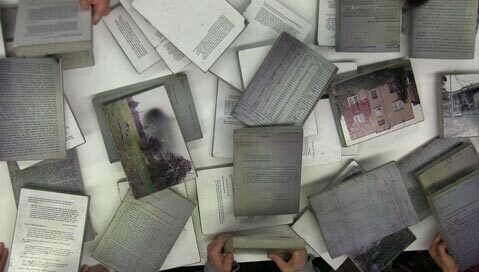 Within the installation I am working with three different approaches towards that time and space: analogue photographies of the historical places, archive-material and excerpts of an interview that I was taking.